We decided to make a playmat because it’s a great gift for any time of year. You can throw it on the grass in August, or lay it on the living room floor in December. It’s stuffed with our thickest cotton batting so it’s soft and dense plus it’s totally washable so you don’t have to be precious with it. Best of all, even though it’s hand quilted, it comes together really quickly since it’s not basted. 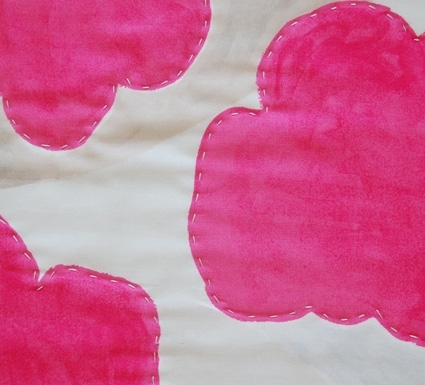 It’s a perfect, breezy, end of summer project for any baby! Cut four 18 inch squares from each of the fabrics. Cut the batting into a 35 1/2-inch square. 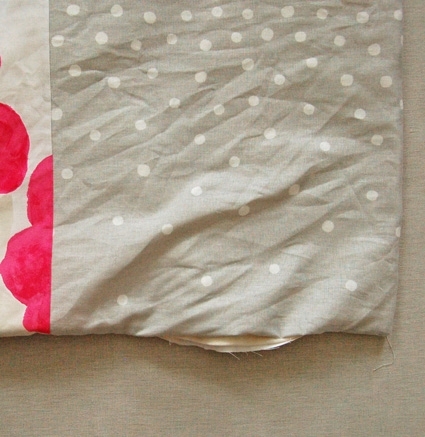 Sew a grey square to a pink square right sides together, along one side, with a 1/4-inch seam allowance. 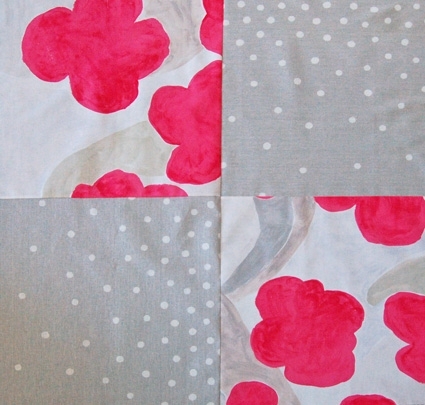 Sew another grey square to a pink square in the same manner. Then sew these two sewn strips right sides together with a 1/4-inch seam allowance so that the like squares are diagonal to one another, as shown above. This is the top of the mat. Repeat the same steps to make the back of the mat. Press and lay the 35-inch square of batting flat. It’s best to do this step on the floor or other large surface so the whole thing can lay as flat as possible. Smooth the quilt top, with it’s right side facing up, on top of the batting being careful to line up all four sides neatly. Smooth the quilt back, wrong side facing up, on top of the batting and top. 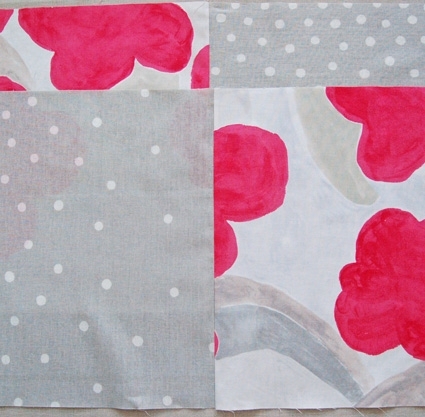 Arrange it so that the grey fabric squares of the top are directly on top of the pink fabric squares of the bottom, so that the top and bottom will be opposites. Again, make sure that all four sides line up neatly with those of the previous two layers. This three layer pile is your quilt sandwich. Pin it together around all four sides. 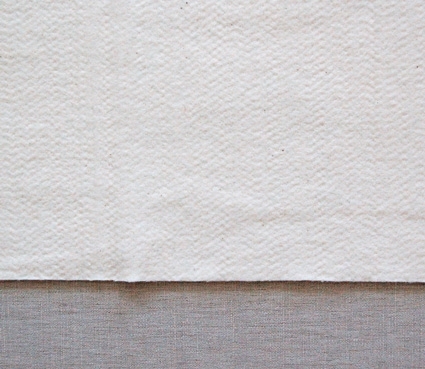 Sew the three layers together across all four sides with a 5/8-inch seam allowance, leaving a 4-inch gap on one side as shown above. 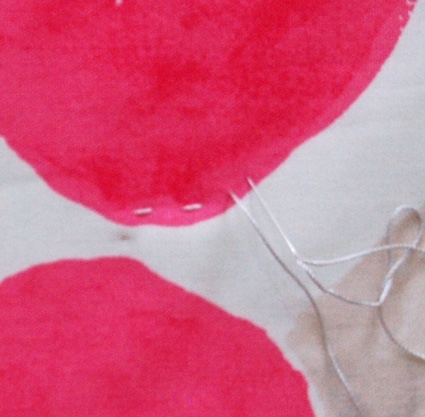 If you have one, use your sewing machine’s quilting foot to do this. 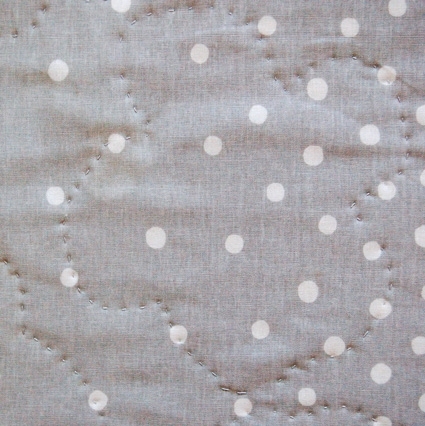 Turn the quilt sandwich right sides out, through the gap, so that the batting ends up in the middle. Press and pin the gap closed making sure to encase the batting. 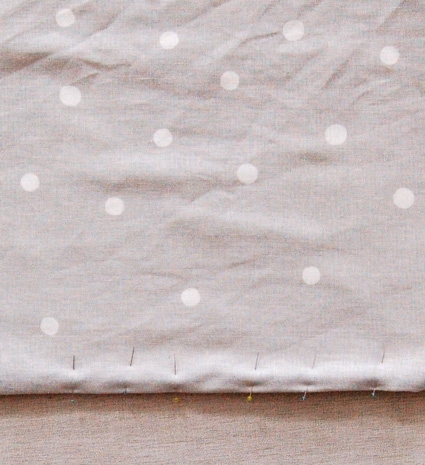 Sew the gap closed with a blind stitch. Press the entire mat flat. Since you aren’t basting, this is an important step! 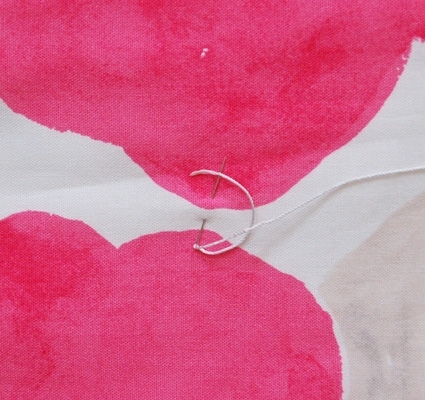 Tie a small knot at the end of an 18-inch length of the silver embroidery thread. Insert your needle through only the top and batting of the mat and then pull the needle out just on the inside of one of the pink flower shapes. Pull the thread until the knot pops though the entrance point but not so hard that it pops out of the exit point. This will hide the knot. Now stitch 1/4-inch quilting stitches through all three layers of the mat (the top, the batting and the back) around the inner edge of the pink flower shapes. You can use larger stitches if you like and don’t worry about keeping them totally even, the handmade free quality of the quilting is part of what makes this project beautiful! Stitch inside all of the flowers. To finish with a length of thread tie a little knot at the end of the stitching and hide it in the same way you did at the beginning, by pulling it through the top two layers, and then snipping off the excess thread. When you’re done the top will look like this. Since the back is the opposite of the front, the quilting will have a different, and very cool, effect when you turn the piece around. 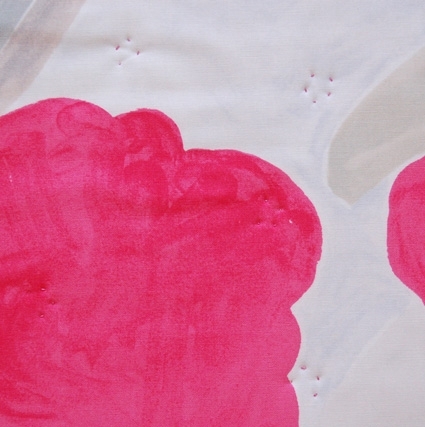 Above is the back of the floral quilting. 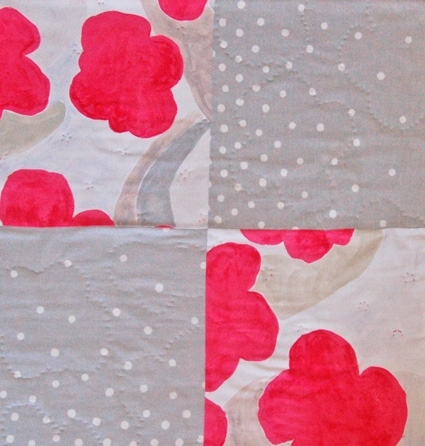 And here is the back of the polka dot quilting. 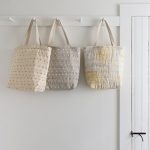 Once you’re all done this piece should be sturdy, washable, and above all, cheerful and pretty. Enjoy! Announcing: More Last-Minute Knitted Gifts! Can’t wait to make this! Now if I only had those lovely fabrics! Gorgeous! 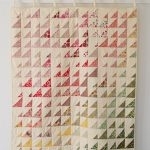 I’ve never made a quilt, but this has inspired me! I have a 4 month old who needs this play mat. Ordered the material, now foot tapping waiting for post to arrive. This will be wonderful for my new grand daughter. I love the random style of this very creative project. Thanks for posting. Oh, I love that fabric! Gorgeous! I also LOVE that cute little bunny lurking in the background, is there a pattern floating around for him? This looks so cute. I am a beginner to sewing and looks like a project I could handle. If i order the batting in the crib size that should be enough for this project right? This is absolutely adorable! And presented in such an approachable way! I'll have to make this, thanks so much. 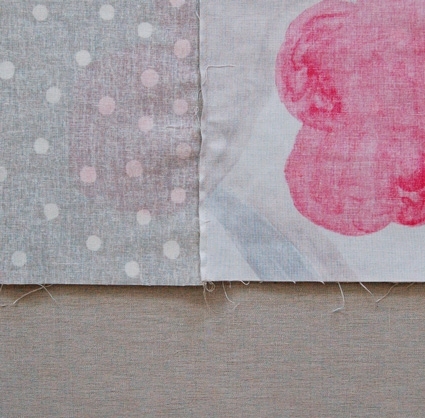 And I love the grey and pink together, beautiful fabrics. I love love love this playmat! I would really like to make it as a full size quilt though. 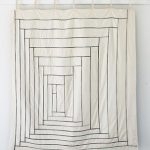 Would this method of quilting work in a bigger scale? 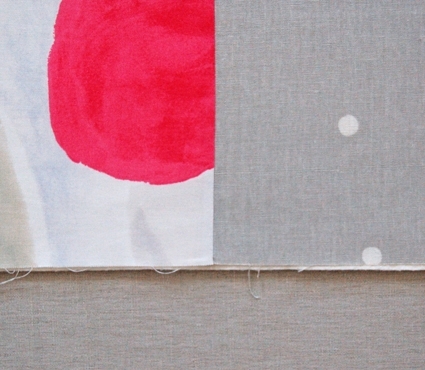 I'm new to quilting and this looks like a nice simple project for me. This is so darn cute! 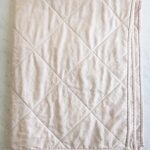 I have never quilted in my life but this is adorable and I have to choice but to make it:) I have 3 friends that are preggo now and a couple that just had littles…What a great gift! Thanks for sharing! This was my first sewing project and it turned out beautifully! I used the alphabet fabric from P+B Textiles and I didn't want to cut any of the adorable letters in half, so I just kept the two pieces whole (the back was their bee fabric). It turned out more like a thick quilt. I also tied knots with the embroidery fabric instead of stitching. I love it and you can see a photo here: http://flic.kr/p/8FtXCp. It made a great gift; if I can make this, anyone can! I love this! And all of the projects I viewed, VERY inspiring! 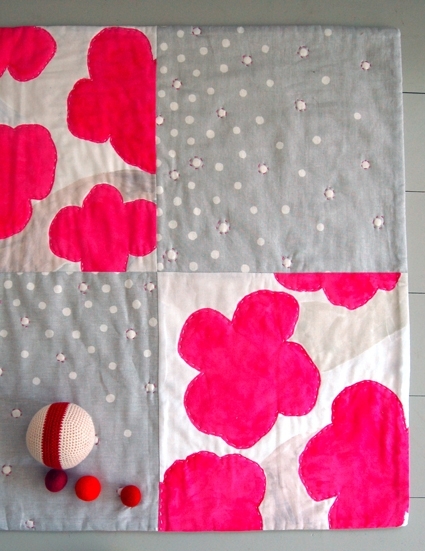 I'm giving this a go as a larger quilt for my Baby-on-the-Way. I'm doing 9 squares instead of 4. 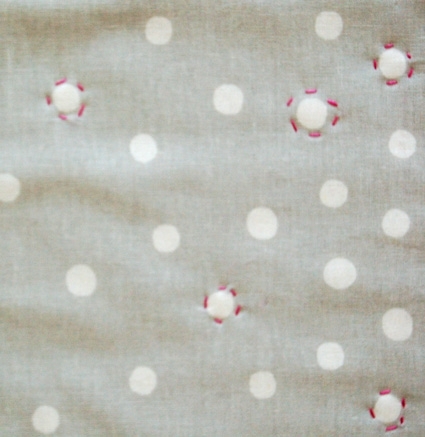 Slightly terrified though since this will be my first attempt at sewing anything other than a basic baby blanket. This is a very clever pattern. I did a modified (slightly lazier version) with some kokka fabric I ordered from you at purlsoho last year. It took me 3–5 hours to finish mine. Just lovely. Thank you so much for this. I have to say – I LOVE this site. I am a knitter, but must learn to sew so I can make this for a friend who is expecting. I see that you are out of the fabric that you used in making this. Any recommendations on fabric to use? Please let us know if you need any more suggestions and thanks for writing in! I am brand new to quilting, except for pot holders I made from this site, this is my first quilt. I made it for sister-in-law who just became a grandmother for the first time. It was incredibly easy to make. I used the "star" stitch on my Janome rather than embroidering by hand. It turned out incredible!! 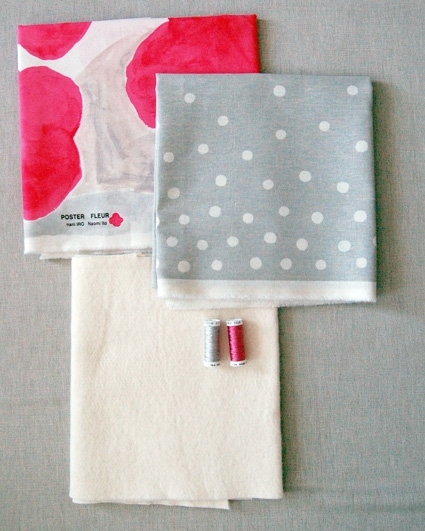 Hello, this playmat is simply lovely and would be very practical on our wood floors! 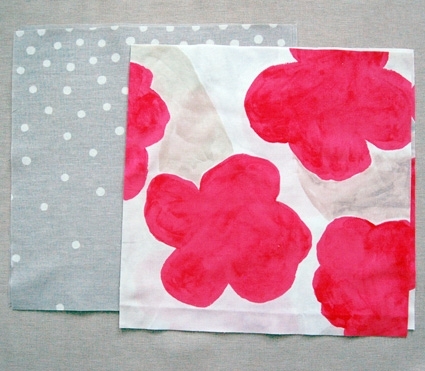 I see that you no longer stock the fabrics used in the tutorial, could you suggest some alternatives please for the magenta flowers and grey dots? The new collection doesn’t have a big magenta print but if I were making this again today I would use Sound Circle Gray and Jewel Song Pocho Asagirl. Hello, I was wondering if you had any tips for how to sew the quilt sandwich together if you don’t have a quilting or walking foot for your machine? Thank you so much for writing in! 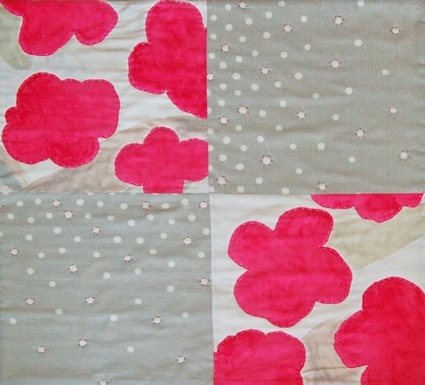 You can sew the quilt sandwich together as it is written without using a quilting or walking foot. 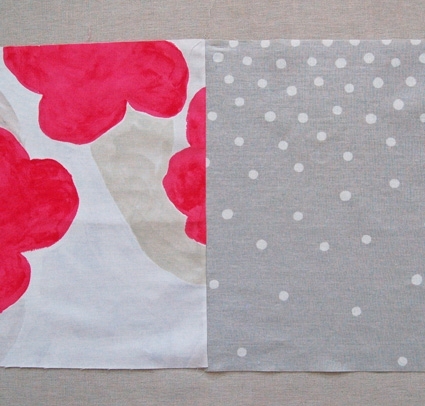 You’ll make your quilt sandwich, top fabric right side up, batting then bottom fabric wrong side up. Pin all three layers together. Then just sew around the blanket with your regular presser foot using a 5/8-inch seam allowance. Leave a 4-inch gap on one side. 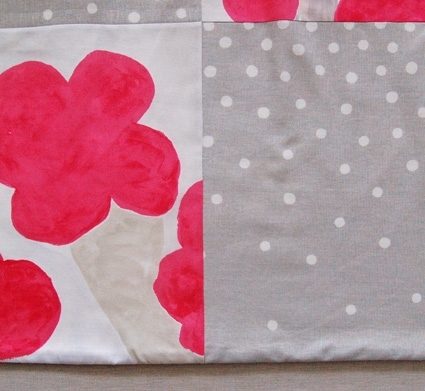 Turn the quilt sandwich right sides out, through the gap, so that the batting ends up in the middle. 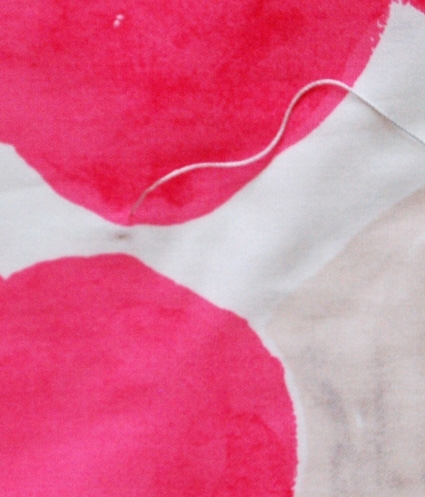 Then you’ll sew that gap closed with a blind stitch. I have been in love with this pattern for a while now, and now that I’ve recently found out I’m having my own little baby girl in April this is my top dream project! I’m wondering if you can recommend some fabric choices since those pictured here are no longer available? Thanks so much for all you do, your site and patterns are truly my fuel for many hours of inspiration and many cherished projects. Thanks for writing us! 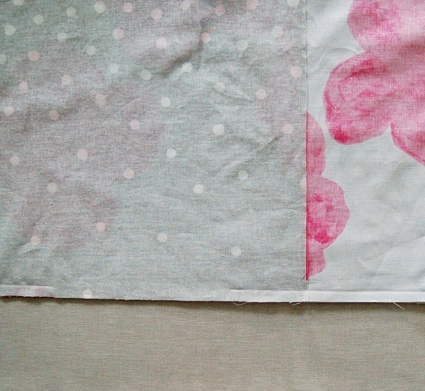 I recommend using Nani Iro Double Gauze and Liberty of London. It would be lovely! Really into this! Perfect playmat for kids. Gonna try this out.